I loved the camaraderie and “broseph”-ness of this photo. I believe it was taken while the guys where having a smoke break during the filming of Ghostbusters. 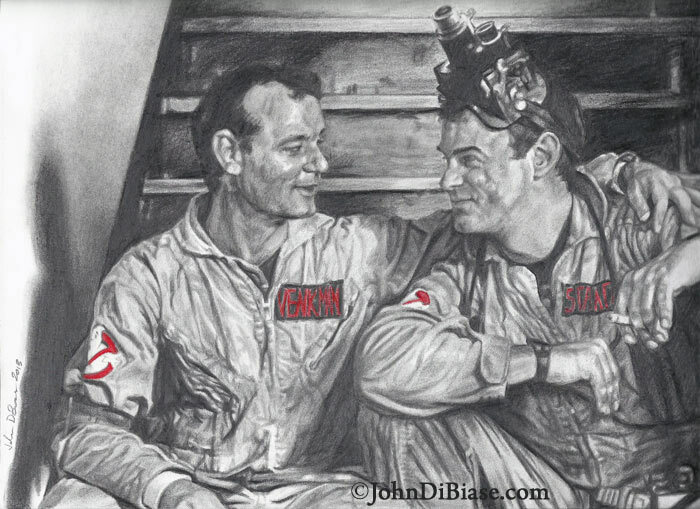 This was a big challenge for me because, for the life of me, I could NOT reproduce the face of Bill Murray in the original photo for this drawing. What I ended up doing was use other photographs for reference and then eventually pausing the movie near the beginning (when he’s flirting with the girl in the opening scene “I was just about to say, ‘8 o’clock?’ You’re a legitimate phenomenon!”) to use as a reference. I’m not 100% happy with or satisfied with the end product, but I do like it and found it to be quite a stretch for me. In all honesty, I would have given up long before this drawing really started coming together. I drew it entirely freehand, which always creates a bunch of obstacles… including proportions! I used regular Staedtler drawing pencils and red Prismacolor Premiere pencils for the patches.